Researchers at Missouri S&T have found an unprecedented, economical method for creating high-performance inorganic thin films, or "epitaxial" films, used in the manufacture of semiconductors for flexible electronics, LEDs and solar cells. 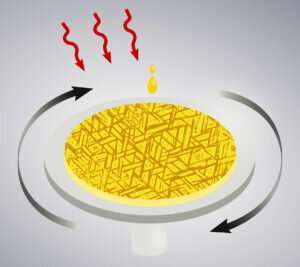 The research is published today in Science in the paper titled "Spin Coating Epitaxial Films." "We've come up with a super-easy method that has never been done before to make these films from a solution using commercial spin coaters," says Dr. Jay Switzer, the Donald L. Castleman/Foundation for Chemical Research Professor of Discovery in Chemistry at Missouri S&T. "This is an inexpensive and readily accessible route to single-crystal-like materials that should exhibit superior electronic and optical properties. "In particular, our work with highly ordered epitaxial deposits of the perovskite material cesium lead bromide, a novel semiconductor used in highly efficient photovoltaic solar cells, stands to increase the efficiency of solar cells produced with this material," Switzer adds. Until now, spin coating has been primarily used to make lithographic polymer coatings or to deposit organic semiconductor films on substrates, but the resulting films have been either polycrystalline or without crystalline structure—not epitaxial with the sought-after level of perfection needed for today's state-of-the-art electronics. "We've learned to use spin coating to make highly oriented films and nanocrystals on a variety of inorganic substrates," says Switzer. 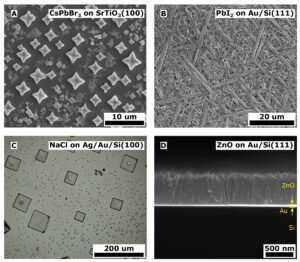 "Until now, atomically perfect epitaxial films have been made by several other methods, and some of those are very expensive and require ultra-high vacuum."